Dell on Thursday upgraded its XPS 13 ultra-thin laptop with Intel’s recently introduced Kaby Lake-U processors. The new notebooks keep the chassis and display panel options, but sport faster CPUs, speedier memory, a Killer 1535 802.11ac WiFi card, as well as a higher-capacity battery. Dell plans to offer new XPS 13 notebooks in rose gold, gold and silver colors starting from October 4, 2016. Since Intel’s 7th generation Core i-series Kaby Lake-U processors are drop-in compatible with platforms supporting the Skylake-U chips, the new Dell XPS 13 uses exactly the same chassis as the Dell XPS 13 introduced a year ago and based on the previous-gen CPUs. That means, we are talking about systems made of machined aluminum and carbon fiber, which are 9 – 15 mm thick and weigh 1.2 – 1.29 kilograms. Display panels of the XPS 13 also remained the same: users can choose between a QHD+ (3200×1800) panel and an FHD (1920×1080) panel with or without touch support. Meanwhile, the new 7th generation Intel Core CPUs run at higher frequencies s compared to their predecessors, feature considerably improved video encoding/decoding engine, refined graphics as well as Speed Shift v2 technology. As a result, the upgraded XPS 13 will deliver higher performance and better responsiveness at the same power than the predecessors. Otherwise, as with the past generation of systems, Dell is offering from 4GB to 16GB of LPDDR3-1866 memory. Yet another improvement of the upgraded Dell XPS 13 is Rivet Networks' Killer 1535 802.11 2×2 Wi-Fi + BT 4.1 controller that promises to add some useful features with the help of refined software. Finally, the 2016 XPS 13 also comes with a 60 Wh battery, up from 56 Wh battery on the previous-generation model. Dell claims that thanks to the new battery and power optimizations of the platform, the FHD version of the XPS 13 will work for up to 22 hours and the QHD+ machine will run for up to 13 hours on one charge. 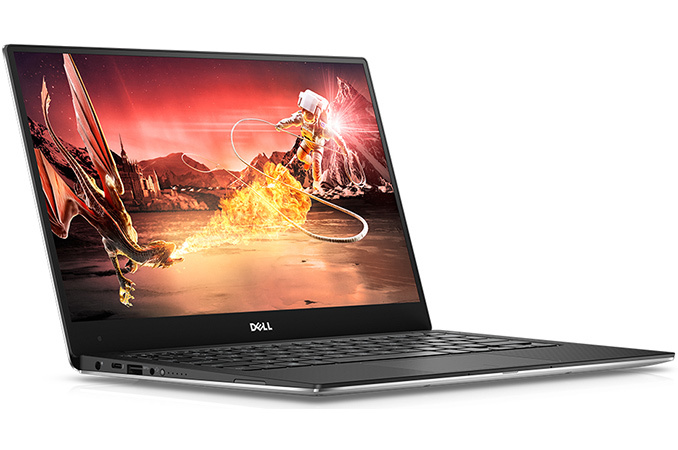 Other specs and features of the new Dell XPS 13 are the same as those on the 2015 model: PCIe SSD on higher-end models (the entry-level one still carries a 128 GB SATA drive), one Thunderbolt 3 port (hence, one USB Type-C receptacle), two USB 3.0 ports, an SD card reader and audio connectors. Dell will begin to sell its XPS 13 in silver, gold and rose gold colors on October 4 starting at $799. Traditionally, the company will also offer XPS 13 Developer Edition based on Ubuntu 16.04 LTS starting at $949.